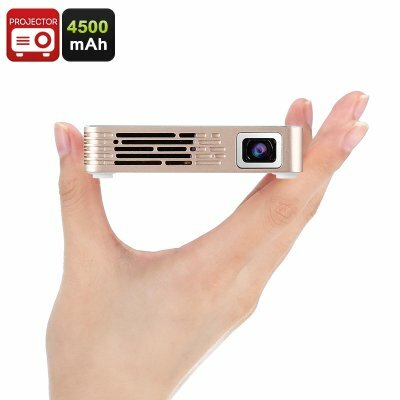 Successfully Added Mini Projector - 100 Lumen, 1080p Support, HDMI, USB, Built-In Speaker, 3.5mm Audio Jack, App Support, 4500mAh, Linux OS to your Shopping Cart. Turn any room into your private cinema with this remarkable mini projector. With its compact size, this LED projector can be easily carried around anywhere you go. Simply attach it to your laptop, tablet, or TV – and you’ll be able to enjoy massive visuals on your wall. This mini projector supports an HDMI and USB input, thus bringing along great connectivity. Additionally, it can be used with the dedicated mobile Application via your Android smartphone. By supporting 1080p media files, this pocket projector is capable of handling the latest Full-HD media. Its native resolution is 480p, meaning it treats you to crisp visuals while enjoying your favorite films. With its 100 lumens light, this mini projector produces sharp images in any semi-dark room. It features a projection distance of 1 to 4 meters and a maximum projection size of up to 120-Inch. This makes it perfect to be used in medium-sized living rooms and offices. With this mini projector at your side, you’ll always be able to give great presentations or to watch a movie in its fullest glory. Thanks to the 16:9 aspect ratio, this little gizmo is perfect for enjoying the latest wide-screen films and series. The projector comes with a built-in speaker and additionally features a 3.5mm audio jack. It furthermore supports a whopping 4500mAh battery. This cell allows you to use your gizmo wirelessly without the need for an external power supply. Whether you use this cool gadget for watching films or giving presentations, it is sure to meet all your media demands.